There is no doubt about it, catching the Berlin Philharmonic Orchestra in their iconic Philharmonie in their hometown, remains something of an event. Forget all the HD big screen broadcasts. Cliché but true: nothing beats the live experience. With a program described as “Two Symphonies, one with a soloist, one with a hero”, the Berlin Philharmonic under guest conductor Tugan Sokhiev and joined by violinist Hilary Hahn, offered a remarkable evening of undiluted romanticism. Neither Tchaikovsky’s Manfred Symphony nor Vieuxtemps’ 4th Violin Concerto are works one would readily associate with the Berliners, but then again, lest we should forget, the orchestra has long since left the path of security and predictability when it comes to repertory choice. It’s with an unusual setup like this that an orchestra can demonstrate its versatility and strength. And that’s exactly what happened here. 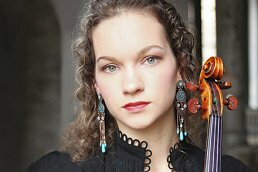 Categories: Concert reviews | Tags: Belgian violin school, Berlin Philharmonic Orchestra, Berliner Philharmoniker, Eugene Ysaÿe, Henri Vieuxtemps, Hilary Hahn, Jascha Brodsky, Manfred Symphony, Marc Haegeman, Philharmonie, Piotr Ilyitch Tchaikovsky, Tugan Sokhiev, violin | Permalink.